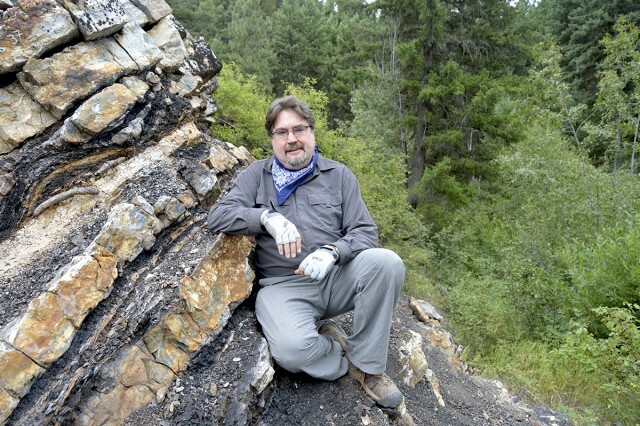 Dr. David Greenwood, poses at the Princeton Chert fossil locality, near Princeton, B.C., in august 2015. A Brandon University (BU) professor is thrilled to be giving a talk this month at the world-renowned Royal Tyrrell Museum of Paleontology in Drumheller, Alta. Dr. Greenwood is well-known for his ongoing research on the fossil plants of the Eocene Epoch, a time about 50 million years ago when the world was so warm, great forests and diverse animals including alligators lived in the Canadian Arctic. His research has wide applications for scientists and Canadians who are working to understand how modern-day climate change will affect plant and animal life. Every summer during his time at BU, Dr. Greenwood and his students have been visiting fossil sites in British Columbia looking for plant, insect and mammal fossils — yielding several impressive discoveries. This past summer, the expedition yielded boxes and boxes of plant fossils along with some superb insect fossils, including a large saw fly. Previous expeditions have been funded by the Natural Sciences and Engineering Research Council (NSERC), as well as the Brandon University Research Committee. He currently holds an expedition grant for field work in British Columbia from the U.S. based National Geographic Society Committee for Research and Exploration. An overview of his ongoing research, including the most-recent expedition, will be discussed during Dr. Greenwood’s talk in Drumheller on Thursday, Feb. 18. There is no admission charge for the public to attend, and for those who can’t make it, the Royal Tyrrell Museum will also post a video of the talk to YouTube. Westman residents will have an opportunity to hear Dr. Greenwood a little closer to home this month. He’ll also be discussing his research on Friday, Feb. 26 in an afternoon talk that is part of the BU Science Seminar Series. The public is welcome to attend the talk, scheduled for 3–4 p.m. in Room 4-47 of the Brodie Building on the BU campus.